Fab Four's music to be streamed by Christmas? 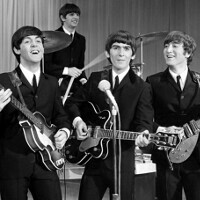 While the Beatles were trendsetters musically, they also were influential in fashion, film and other parts of culture that weren't normally touched by a rock band. Despite their widespread appeal, and music that has managed to survive half a century, it is somewhat difficult to find the Fab Four's music online. But that might be changing. According to Billboard, Beatle music will be available for streaming as soon as this coming Thursday, December 24th. Yes, you can build a Beatle radio station on Pandora, but that is due to the unusual way that licenses are handled on the app. The streamer operates under a government statutory license, which allows you to hear a particular band no more than four times in three hours. So if you want to stream the Beatles on-demand, non-stop, you will have to wait until next week. That is when the licensing will supposedly be in place for all albums recorded by the quartet from Liverpool, to be heard over streaming music services. Even though it has been 53-years since "Love Me Do" was first broadcast over British radio, Beatle music is still very much in demand. When the group's catalog hit iTunes in November 2010, it led to the sales of 450,000 albums and 2 million songs in a week. While it is unknown which streaming services will be offering the Moptops, Spotify and Rhapsody both refused to comment. Considering there are things that tie Apple in with the Beatles including iTunes, Apple Records and the fact that they were Steve Jobs' favorite band, we'd be surprised if Apple Music wasn't one of the destinations for John, Paul, George and Ringo. WTF kind of Beatles fan doesn't already have their entire discography on mp3 anyway? You're going to skip cassette and 8-track? Rude. No one had ever argued that cassette gives the best sound. The kind of Beatles fan who knows their music doesn't sound the same on mp3 as it did on vinyl. There, I said it. Digital reproduction doesn't pick up the original background sounds, lacks depth and you can't even hear the picks stroking the guitar strings. You need to listen to Hendrix on vinyl to fully appreciate what I'm talking about. I feeel bad for the young generations who grew up on synthesized music. I agree. Nothing beats listening to Zappa, The Who, or Firesign theater in quad. I can't fit a record player in my pants though. At least there's FLAC. Copyright got all over that. UMG_MK blocks the videos. Can't wait for Beatles on Google Play! Probably Apple Music exclusively, isn't iTunes still the only place to buy Beatles digital songs? Yeah, which is kind of dumb, considering Apple broke a contract with Apple Music by selling music on iTunes.